Newer cars give access to the engine’s control computer (ECU) through a connector close to the driver’s seat. The MobilScan OBD adapter plugs into this connector. The MobilScan OBD adapter communicates with the mobile phone via Bluetooth. Part of MobilScan is a software application running on the mobile phone. The MobilScan software sends commands and requests via Bluetooth to the MobilScan OBD adapter which translates them into something that the ECU understands. The replies go in the opposite direction and are being displayed and stored by MobilScan running on the the mobile phone. If you have a problem connecting to your Mobilscan adaptor the its always a good idea to take a look at out tutorial videos. Do the car have the OBD protocol, not all car have the data protocol even thought they have that OBD socket, in general the car has to be a model after 2001for petrol cars, Diesel after 2004 small trucks over 2500 kg after 2007. If you are trying with the engine turned off and egnition on , then try to start the engine some ECU’s (Engine computer) demands over 12 Volt to communicate. Try with another vehicle, simply to test if it is the car or the Mobilscan system, some cars have the diagnostic fuse removed or aomething else defekt. Use the market app on your phone (search for MobilScan OBD). 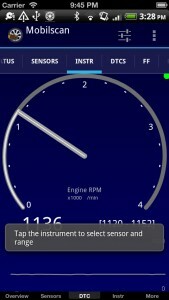 Use the App Store app on your iPhone / iPad, and search for Mobilscan OBD. Scan the QR-code present on this page, if you have the Barcode Scanner app installed on the phone. How do I get the adapter? Android phones: Order it on this page, by using the PayPal payment service. iPhone etc. : Order it on this page, by using the PayPal payment service. Or you can buy the adapter from one of our retailers. Why do I need to buy the adapter from you? We have chosen to give away the app for free. As we are not running MobilScan (just) for the fun of it, we need to charge you one way or another, if you want to use the product. We have decided to lock the app, in the sense that it will only work with adapters bought from us. This way, we are able to ensure that you get a combination that will actually work, and we get something to eat. What are the code categories? Can I see some screenshots, please? This beta is very close to the final version. Is this a great product? 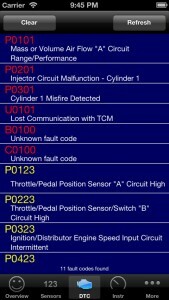 An OBD adapter is a device that you plug into the diagnostic connector of your vehicle. It has – in addition to other clever stuff – a Bluetooth or WiFi interface, which allows the MobilScan software to access the data from the vehicle’s ECU wirelessly. When will MobilScan do XXXXX? Well, you tell us…. We have lots of good ideas and would like to fulfill your wishes as quickly as possible. However, we have to prioritize, so please drop us an email here: sales@mobilscan.dk, if you have an idea for some feature that you think may be of value to others. We make no promises, though..
How does MobilScan differ from other OBD-scanners? These are typically very expensive, and often brand specific. They are designed from brand-specific knowledge, and may allow adjustment of engine parameters. MobilScan enables you to use your regular, relatively inexpensive phone, and allows you to send data to yourself or others for later review at your convenience. What should I be careful about when using MobilScan? 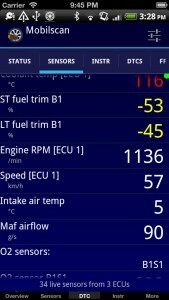 The reason for this is that clearing the fault codes implies a ‘reset’ of the ECU, and it is more kind to the engine to do this when the engine is not operating. Could I damage my vehicle by using MobilScan? The most risky thing you could do would be to clear the fault codes. This of course removes the possibility for your garage to see the fault code and determine its cause. Fault codes are the car’s way of telling you that it wants a health check. Making it shut up (by clearing the codes) does not make it healthy. Thus – only clear the fault codes if you have a good reason. How do I find the OBD connector in MY vehicle? The connector is required to be reachable from the driver’s seat. Common locations are beneath the steering wheel column, at the fuse box, behind a convenience storage compartment or similar. Yet another one (in Danish) can be found here. Finally, MobilScan may transmit the data received from the car yourself or others, allowing review and comparison of data whenever you please. What are the features of MobilScan ? Note 1: This requires internet access from your phone. What does MobilScan NOT do for me? 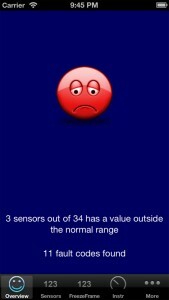 Show data from sensor measurements which your car do not perform..
Will MobilScan work with my vehicle? 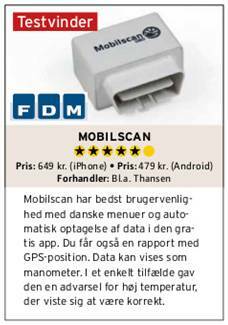 The MobilScan OBD adapter should work with all light vehicles sold on the European market since 2001. All such vehicles are required to conform to a certain emissions-related EU directive. Certain brands and models began supporting an equivalent standard – OBD-II – from 1996, due to US market requirements. Note that diesel vehicles sold before 2004 are NOT covered! Note that vehicles over 2500kg before 2007 are NOT covered! You may want to check this site (in German) for compliance of your vehicle. Will MobilScan work with my phone? MobilScan works with Android smartphones with Android version 2.1 or newer. If you are able to install the app, it should work. Mobilscan for iPhone is tested on iPhone 4/4S, iPad 2/3 and iPod touch 4th generation. Mobilscan requires thet the device is updated to iOS 5.0 or later. Can I leave the MobilScan adapter in the vehicle connector? The adapter consumes about 0,6W (i.e., about one tenth of the power consumed by a commonly found 5W interior lighting bulb). If you by experience know that the car battery tends to discharge seemingly by itself, we’d recommend not to leave the adapter plugged in, however. Do you have some training material, video, tutorial or similar? You will find our video tutorials here.